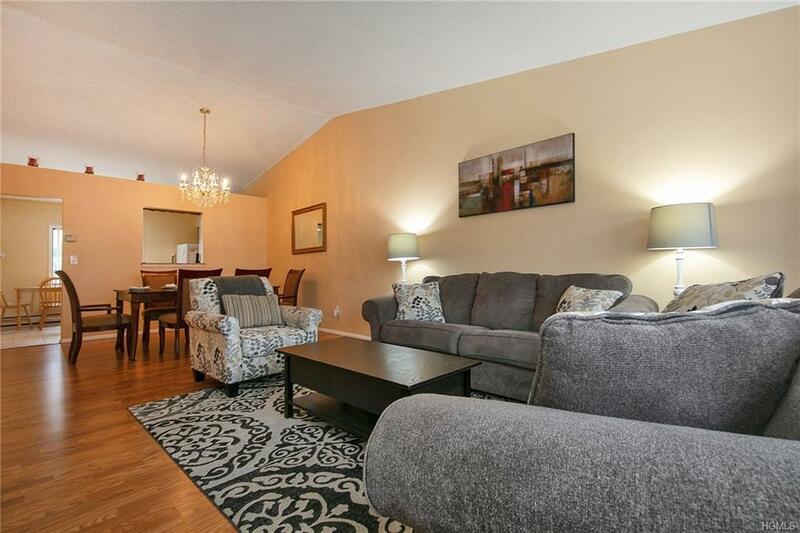 Sun-filled & spacious 2nd floor condo with a very open concept. Step inside to an over sized combination Living rm & Dining room with cathedral ceilings that is perfect for entertaining friends & family. Eat-in kitchen with tons of cabinets & counter space & newer appliances. Wide hallways with tons of closet. Master bedroom has a full bathroom & 2 closet. 2nd bedroom is over-sized. Full newer bathroom. Laminate hardwood looking floors. Laundry rm w/storage. Tons of closets & storage. Pull Attic storage also. Assigned parking & plenty of parking for guest. A great starter home why rent when you can own. A commuters dream: moments to Nanuet Train Station, bus to NYC, NYS Thruway exit 14 park & ride and Garden State Parkway, 30 minutes to GWB. Minutes to the fabulous Shops of Nanuet: go for a walk & enjoy the restaurants & shopping. Close to all major shopping in the area. Call now for private showings. Listing courtesy of Linda Fernandez of Keller Williams Hudson Valley.